French President Emmanuel Macron summoned top security officials on Monday after police failed to contain resurgent rioting during yellow vest protests that transformed a luxurious Paris avenue into a battle scene. Prime minister Edouard Philippe promised to announce new measures to avoid a repeat of Saturday’s violence, in which rioters set life-threatening fires, ransacked luxury stores and attacked police around the Champs-Elysees. The new surge in violence came as the four-month-old yellow vest movement demanding economic justice has been dwindling. Images of the destruction — including from a bank fire that engulfed a residential building and threatened the lives of a mother and child — could further erode public support. However, the renewed attention energised some protesters, who took to social networks to call for new protests this Saturday to occupy the avenue to demand lower taxes and more support for workers from big business. 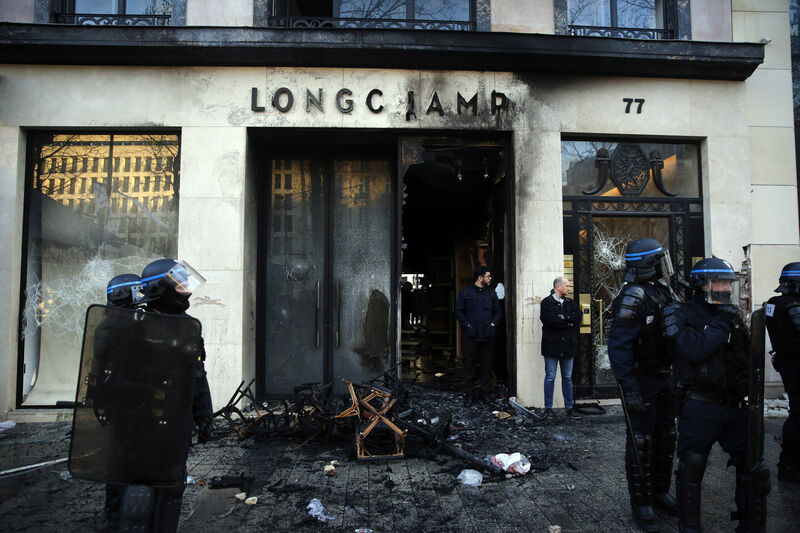 High-end boutiques along the Champs-Elysees remained closed and boarded up on Monday, some of them ransacked and charred from fires set by rioters. The Finance Ministry held a meeting on Monday with groups representing small businesses, restaurants, hotels, insurance companies and banks to estimate the economic impact of the protests. The Paris region’s Chamber of Commerce said 91 businesses suffered consequences from Saturday’s riot at the Champs-Elysees, 80% of which were severely damaged. It called for an “emergency plan” to support the shopkeepers and employees. 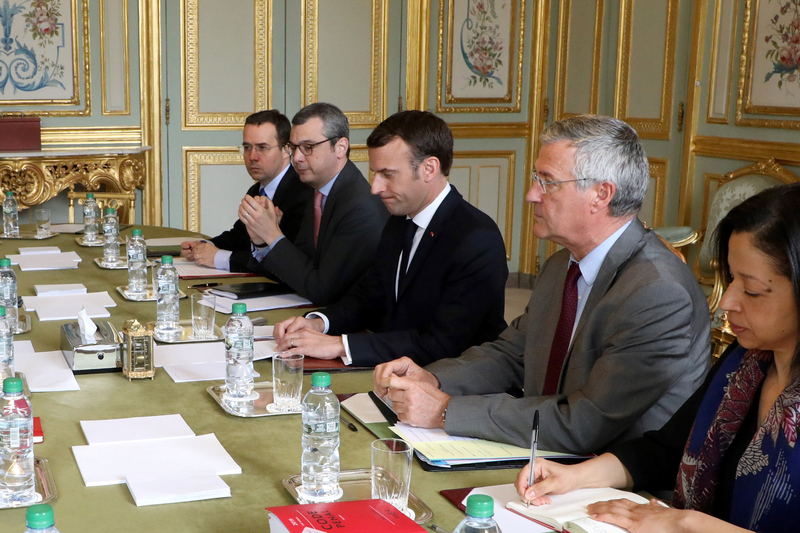 One of the security officials meeting on Monday with Mr Macron, junior Interior Minister Laurent Nunez, acknowledged the French police response to Saturday’s rioting was “a failure”. Mr Nunez said Monday on RTL radio that police had prepared for an upsurge in violence but the protesters were exceptionally radicalised. He said police were “less reactive” on Saturday than in previous demonstrations, and notably more cautious about using rubber ball launchers because of numerous injuries they have caused at previous protests. Last month, the French Parliament passed a bill backed by Mr Macron’s government to further prevent violence during protests and to help authorities maintain order. The “anti-troublemakers” law has not yet taken effect since the Constitutional Council must assess it first. It would authorise regional prefects to prevent people seen as a serious threat to public order from protesting, and would force protesters involved in violence to pay for damage. It would also make it a crime for protesters to conceal their faces, punishable by up to one year in prison and a 15,000-euro (£12,800) fine. The bill has been criticised by rights groups, opposition members and even members of Mr Macron’s centrist party as going too far in restricting freedoms. Protesters had tried to raise their profile on Saturday to mark the end of a national debate that Mr Macron had organised to respond to concerns about sinking living standards, stagnant wages and high unemployment.